Key Difference: Wordpress started off as just a blogging system. Now, it provides a full content management system. Blogger (Blogspot) refers to a free blog publishing service of Google. Wordpress originated in 2003 to enhance the typography. It developed into a major self hosting blogging tool in the world. 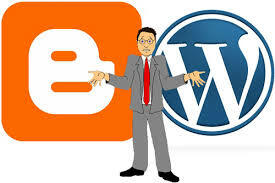 One can start a blog or create a web site using Wordpress. Wordpress is a software that is developed on PHP and MySql. It was founded by Matt Mullenweg and Mike Little. Wordpress can be considered as a successor to b2/cafelog. Since its origination, it has been released in various versions. It has a core development team which comprises of Ryan Boren, Mark Jaquith, Matt Mullenweg, Andrew Ozz, Peter Westwood and Andrew Nacin. However, it is also developed by its community. The support to the users is provided by its main website WordPress.org. Blogger (Blogspot) refers to a free blog publishing service of Google. Initially, it was developed by Pyra Labs, but later was bought by Google in 2003. The blogs are generally hosted at a sub-domain of blogspot.com. In September 2009, a new set of features were introduced in Blogger. Features included a new interface for post editing, improved methods to handle the images, addition of locations to posts, etc. Blogger is available in various languages. It allows the users to select templates from the available options and then customize them. It has also launched a mobile app. Users can post and edit blogs using this app service. Wordpress started off as just a blogging system. Now, it proves a content management system. Blogger (Blogspot) refers to a free blog publishing service of Google. A free account includes – A blog, 3 GB of storage, a tool to publicize the blog with social networks, track of visitors, etc. A Premium Upgraded account includes - Custom design and domains, premium themes, addition space for storage, videopress for uploading and hosting of videos on blog, etc. Free hosting and free Blogger (Blogspot) subdomain, addition of media to posts, mobile access through iPhone and Android apps, SMS or email blogging, access to Google’s advertising schemes, etc. One can register for an account by mentioning an email address, username, password and URL. Comparatively more (third party for the development of themes). No direct editing of the code and no space to include non wordpress related projects. No plugin support and limited design features. Integration with Facebook, Twitter, LinkedIn and Tumblr. Healthcare sector in India diversifying dynamically, generating opportunities for emerging segments, be it providers, payers or medical IT. With growing competition, organisations are cognisant of new challenges and are looking to explore the latest business dynamics and trends impacting their segment. eHealth’s strategy is built on the existing priorities and solutions to cater to the next generation’s healthcare needs and to stand ahead amongst fraternity players. Hey your blog is very nice, such useful information you are sharing. I really like your blog the information is very accurate.